The junk in our trunk will be there until we do something about it, literally and figuratively. Junk in your trunk is a fun phrase. The Urban Dictionary says it means a large behind (a.k.a. derriere). Recently though, Stephen and I had a good laugh about literal junk in the trunk. We were parting after a lunch date, and as Stephen opened his car door, he said he couldn’t figure out why his car stunk inside. He thought it may be because he had parked too close to a dumpster that morning. Upon further exploration, we realized he had left our recycling in his car’s trunk. Ah…the source of the stink—soured milk jugs! That got me to thinking! Our personal issues in life are a lot like the junk in Stephen’s car trunk. We have good intentions about making changes we need to make. We end up putting off those changes because we get busy with all the other important stuff in life. At some point, though, the “stink” creeps in, and we begin to reap the unpleasant consequences. As we said our goodbyes, Stephen said he would drop off the recycling at a nearby recycling station. Later that afternoon he texted, “Good news, the stink is gone!” That’s a fast fix for a literal “junk in the trunk” problem. Fixing our personal issues doesn’t always happen as fast, but then again, we’re sometimes just putting off working on those personal issues. And, sometimes, we don’t think change is possible, so we learn to live with the stink—the “stink” of negative thinking, unkind speech, selfishness, taking health for granted, mishandling of money, etc. We have a lot of “stinky” ways about us as humans, and so the list of possible personal issues that you and I need to work on at any given time is really long. 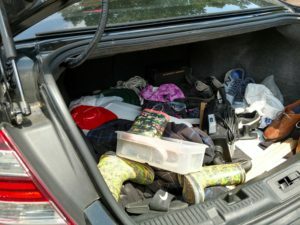 Want to do something about the junk in your trunk? What personal issue (your “junk”) is nagging at you the most right now? Decide to move that one stinky problem higher on your “to do” list. Now, determine one small change you can make today to make this problem a little less disruptive or destructive in your life. You don’t have to solve 100% of the “junk,” but one little step can make a bigger difference than we first realize. Small steps add up! Little by little, we can turn these small steps into lasting change, which means less and less junk in our trunk! Is this small change a change you can make again tomorrow? Even if you can’t commit today, just leave open the possibility that you can keep up the small change you’re considering here. For now, keep a day-by-day mentality to avoid putting too much pressure on yourself. 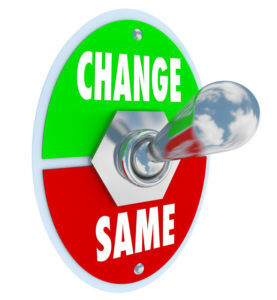 But, as an experiment, see what happens when you start to make this same small change most days of a week (if not all). In fact, I’m a big fan of charts and journals. Consider using something like this to track your progress on the one change you’re working to make. I may suggest to the Urban Dictionary folks that they add this alternate definition of “junk in your trunk” to their dictionary. What do you think?! Got any junk in your trunk? What are you going to do about it? Encourage someone else by sharing your thoughts below in the comments section. I’ll do my best to get those posted as quickly as possible. If you think this article may be an encouragement to others, please consider sharing it via Facebook or Twitter (see below for sharing options). I appreciate it!